Fairness will serve to remind us that some people need repair to maintain access to the internet or to make their lives better, and how to enable a wider range of people to engage in our events. Sessions will also address how we can move towards more inclusive, open design that allows for fair, truer ownership. Earth will address the environmental benefits of repair and product longevity. From looking at design, the raw materials to go into our products, to the carbon emissions of their production, to the problem of their disposal, this stream will explore the broader environmental context of repair. By bringing people together who engage with repair in lots of different ways, we’re aiming to encourage cross-over between these themes. 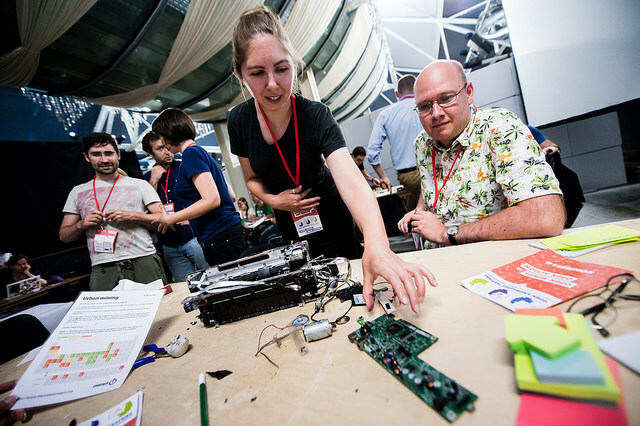 Some of our speakers step back and look at the systems that connect designers to consumers; others look at the global paths taken by the minerals that end up in our landfill; some get right up close and look at frayed wires and faulty circuit-boards. In order to develop a full picture, we need to get used to thinking at a wide range of scales. More than half of our programme is in “unconference” style, where we invite participants to propose and facilitate workshops and skillshares. We hope that our three streams provide a compelling but open way to structure these. Please get in touch if you would like to get involved.